Ask fellow campers about "Rising River RV Park" and nearby attractions. On the South Umpqua river, 7 miles south of Roseburg. A few spots back up to the river, others are a mix of back-in and pull-through. Some long-term residents but sites are well-kept. Most have nice shade trees, and spacing was OK. Good utilities including a wide selection of cable TV stations but missing 2 of the 4 national broadcast networks. Wifi was intermittent. Friendly staff and hosts. We camped at Rising River RV Park in a Fifth Wheel. The near end of the North Umppqua River Trail is a 35 minute drive east on Hwy 138, just past the town of Glide, at the Swiftwater Park. Great day-hiking along the river there. Looking Glass Road is a back way between Medford and Winston - a scenic country-drive alternative to taking I-5. Very pretty park. Level, gravel spot for rig, grassy area for sitting. Picnic bench. Lots of shade trees, has a real park feeling. There's a lovely trail to the river, which is just steps away. Short drive to Roseburg for movies, meals, supplies. We camped at Rising River RV Park in a Motorhome. Plenty of shopping nearby but also a few exits north to Roseburg. All the box stores and different kinds of restaurants. Malls and movie theaters too. 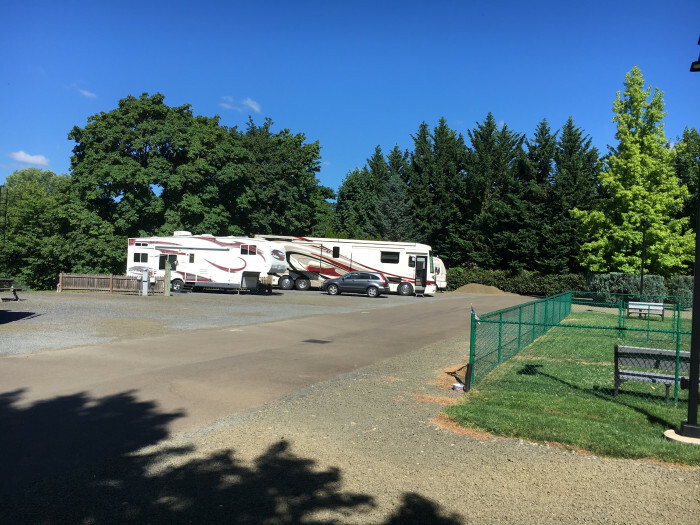 This is a lovely RV park, a little over a mile off I-5. The staff was wonderful and the campground very clean. The fences between sites was an added benefit. 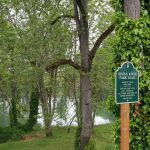 Not to be missed is a very short walk down to the Umpqua River which borders the park and the enormous trees in the owner's yard. When getting of I-5, there is a sign before the first stop light indicating a right turn ... it is incorrect. Continue straight about 1.25 miles and look for a left about 1/4 mile before the bridge over the river. We camped at Rising River RV Park in a Motorhome. Our site was on the river. Very spacious, level gravel, grassy slope to river. 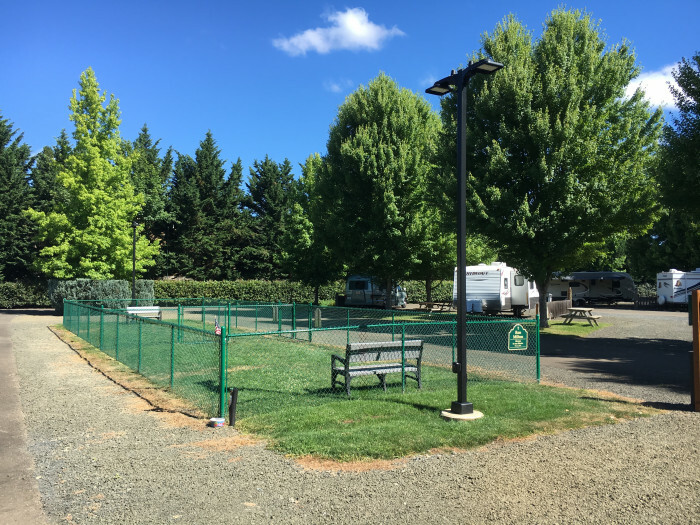 Large divided dog park (could separate large dogs from small or not so friendly dogs from each other) with grass and convenient waste bags and disposal container. Very nice laundry room with several washers and dryers. Showers were separate rooms each having their own locked entrance. Very spacious and clean showers with plenty of hot water with good shower heads. Cable worked differently than we've ever seen before. You check out a remote control when you check in. Then you turn your TV to channel 4 and use the park remote to go from channel to channel and your TV remote only for turning off/on/volume. Lots of channels. This is a gem of a park. We'll be back. We camped at Rising River RV Park in a Motorhome. Love this place! We stay here every time we're in the area or going to Wildlife Safari Park in Winston. Great people and a very clean and scenic park on the river. River view is fantastic! We camped at Rising River RV Park in a Motorhome. Very nice park. Large sites. Small fence between each site gives a sense of privacy. Easy in and out. Some sites back up to the river below with a big stretch of grass between the sites and the river. Great WiFi. Staff was very accommodating, pleasant and helpful. Great park for dogs. Very large fenced dog run with nice grass. We camped at Rising River RV Park in a Motorhome. I enjoy this park very much. I usually stay here a couple times a year. It is right on the river BUT very limited access to the river itself. A lucious green grass walkway along the river. I had a back in site with the river behind me. Gravel, level, no shade. Nice dog park in the middle with two separate sides to keep dogs apart. Office staff could not be more helpful in person and on the phone when I was trying to secure 2 sites together. They try really hard to accomodate me. Escorted to site. Quiet park, and lots of permanents here. Sites very well kept tho. I will be back. We camped at Rising River RV Park in a Motorhome. We've stayed here before. Will again. Staff are friendly and helpful. Our site was level. They now have a fenced dog area. We camped at Rising River RV Park in a Motorhome. This is a very nice campground with a friendly staff. Interior roads are paved and easily maneuvered. We were escorted to our pull-thru site which was plenty long and very wide with good room for our tow vehicle. Site was gravel and level with a grass area and picnic table. Utilities were very good (huge cable lineup accessed using a campground provided remote control). Bathrooms appeared to be new and were maintained to a high standard. Showers were in individual rooms. There was a very nice grass walking area along the river. Located about 6 miles south of Roseburg. 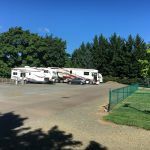 We camped at Rising River RV Park in a Fifth Wheel. Overnighter. Has a river to take walks. It didn't rise like the name says. The hooks ups were reachable and it was level (that's a rare thing). We camped at Rising River RV Park in a Travel Trailer. This is a very nice, quiet park. It's a few miles west of Interstate 5, and a few miles south of Roseburg. There is some road noise from the adjacent Highway 42, but it's not a bother. It sits on the bank of the South Fork of the Umpqua River. We selected a back-in premium site that's huge--35' wide x 75' deep--right on the river. It cost about $4 per night extra--well worth it! The folks who work here are very friendly and very helpful. They seem to enjoy their jobs. The interior roads are paved. There's lots of grass and a very nice walkway along the river; there are some fire rings along the river-walk. We'll be back! 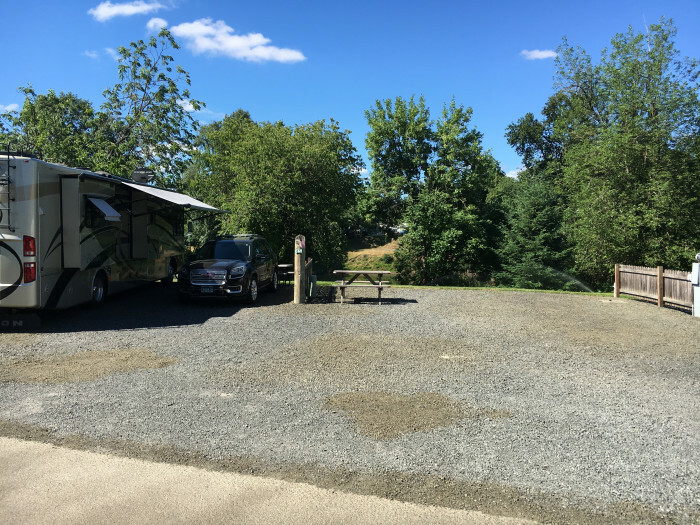 We camped at Rising River RV Park in a Truck Camper. We will definitely return to this friendly park along the Umpqua River near I-5. The people in the office are some of the nicest we've met. The sites are gravel and quite short but there are ample parking spots nearby for your tow. The inside roadways are paved and easy to maneuver. We loved their fenced, grassy dog run in the center of the park. There is also a nice grassy walking area along the river. The wifi was not bad and the cable tv channels were excellent. You check out a remote control device from the office and tune your tv to channel 4 to access the cable. Propane delivered to your site. Very pleasant. 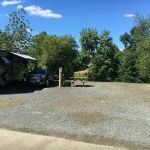 We camped at Rising River RV Park in a Fifth Wheel. Great staff on arrival and was taken to site and helped to back in. Site was level. Park was very clean. Other vans were close but not enough to be annoying. The site was easly big enought for our 24ft C Class. Very beautiful watching the river go by. Only stayed one night but would have loved to stay longer. We camped at Rising River RV Park in a Motorhome. Went to the local brewery in Winston called Looking Glass. Very nice. We loved our stay here. The owner and staff are very friendly and helpful. 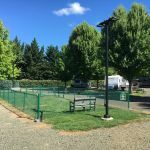 The park is clean, quiet, and located on the bank of the Umpqua River. Beautiful, peaceful setting. Level parking site. Good laundry facility and nice rec room. We would definitely stay here again. We camped at Rising River RV Park in a Motorhome. A bit tricky to find the first time, just call and they give great directions. We had a nice site close to the river. This was lovely. The owner is exceptionally nice and accommodating. The maintenance man who takes care of the park is one of the most pleasant and hard working we have ever encountered. It is apparent there is a lot of effort being put into maintaining the park and providing improvements. All this being said, we would not come back. The park is made up of mostly full time residents. Rigs are old with a fair amount of junk on the outside of their rigs. We were near the trash bin, and there were many residents who pulled up in their vehicles to unload their trash bags into the dumpster throughout the day. Additionally, the sites are quite close together. We camped at Rising River RV Park in a Motorhome. Downtown Roseburg is a must to visit. Cute shops, good restaurants, clean, and not busy. If you need TV, dish site, you might need to choose a site with fewer trees. No traffic or train noise. No pool or playground, but we didn't want that anyway. Clubhouse with movies and books to borrow and small kitchen space for family parties. Close to Winston, and Roseburg not far up the freeway. Very good management as I stayed here previously and had not been back for many years. I will definitely come back again. The managers are the bombs for management; hope they stay. Nice Grocery Outlet nearby in Winston off the 42. Great microbreweries in Roseburg. Melrose Winery was a nice stop and we had a nice dinner at Dino's Italian restaurant. There is a grocery store nearby but for a Safeway or Walmart you have to drive a little further down the freeway into Roseburg. The Wildlife Safari Park is just down the street. Are you affiliated with Rising River RV Park ?